Richard Prince is at it again: The controversial appropriation artist, whose fans include celebrities like Jay-Z, is selling blow-up shots of other people’s Instagram pictures in a posh Manhattan gallery. And he didn’t even ask permission. The case has led to outrage from photographers, but also raises novel questions about how far the licenses granted by sites like Instagram and Snapchat carry in the real world. 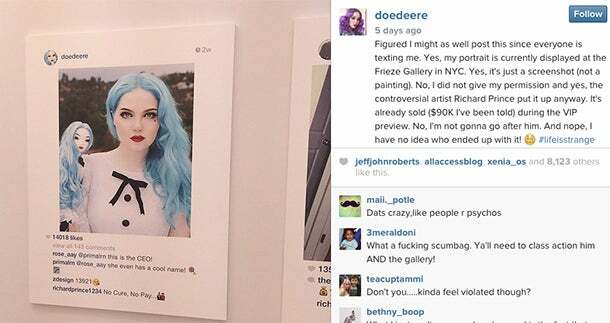 The photo on the wall, as reported by DIY Photography, is the very same as what Deere posted to Instagram. The only contribution from Richard Prince is his comment at the bottom, “No Cure, No Pay” alongside an emoji. Ditto for the other gallery photos, which sell for up to $100,000. As the comments on Deere’s Instagram post suggest, she is philosophical about Prince using her picture, but others think that what Prince is doing is wrong or even outrageous. But is it unlawful? And should Prince and the gallery have to pay copyright damages? But this time around, Prince might be hard pressed to make a similar fair use case since he barely altered the original pictures. This means that the Instagram users might try to ring up Prince and the Gagosian Gallery, which declined a request for comment, for big bucks. But Coleman still doesn’t think this is a clear-cut case of copyright infringement. Citing the New Yorker’s art critic, he says that Prince is making a social comment on voyeuristic social media culture, and that Prince’s Instagram display is a repurposing akin to what artists like Andy Warhol and Marcel Duchamp did before him. Judges, however, may not buy this, especially as they’ve long been reluctant (rightly so, many add) to act as art critics. The result is that a court would probably decide the Instagram case by retreating to the familiar confines of copyright law. Prince has another option, though, and it’s an intriguing one. He could, says Coleman, make an argument that Instagram’s terms of service – which requires users to allow copying inside the platform – create an implied license of sorts that allow him to share the Instagram’s pictures in the wider world. In this sense, Prince is simply another collaborator participating in the collective collage that is social media. But that sort of highfalutin theory probably won’t cut it among those who claim that Prince is just stealing others’ pictures and selling them for lots of money. Sooner or later, this will result in a lawsuit and a big fuss over copyright and social media — which seems to be exactly what Prince the artist is trying to do in the first place.